* Supports Windows XP (x86), and Windows Vista / 7 / 8 (x86/x64). * USB 2.0 High-Speed Connection to Host PC. * Supports MMCA V.4.51, 3.3 or 1.8V eMMC. * eMMC Interface up to 8-bit, 50MHz bus. * Supports eMMC BA/AA/AB/AC Types of BGA Packages. * Supports eMMC BP, GP and ENH_USER Partition, Program and Verify. 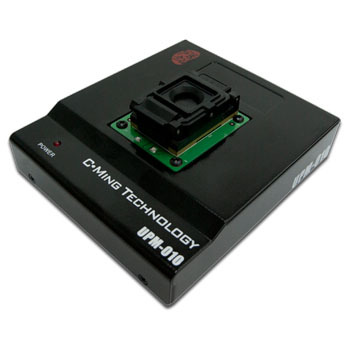 * Supports C-Ming Technology eMMC duplicator's Partition/Mirror/User/AutoScan Modes. * Proprietary unitary file backup for all partition data, EXT_CSD settings, and checksum. * Single partition access mode for BP, GP or user data supporting raw binary data. * Easy to use, automatic parameter checking "eMMC Partition Settings" feature. * Special BP1 + BP2 + User_Data mode. * Special Bottom Align Mode.